AnyGameStarter3 Version 1.2.zip | Description: Needs game versions before 1.21. Does not work with Generations. AnyGameStarter3 Version 1.3.zip | Description: Needs game versions before 1.21. Does not work with Generations. 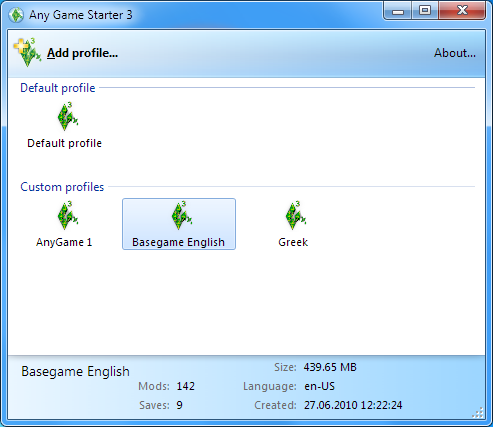 AnyGameStarter3 Version 2.0.zip | Description: Works with all game versions. AnyGameStarter3 Version 2.1.zip | Description: Needs Generations or version 1.22, experimental Steam support. AnyGameStarter3 Version 2.2.zip | Description: Needs Generations or version 1.22, experimental Steam support. AnyGameStarter3 Version 2.3.zip | Description: Needs Generations or version 1.22, experimental Steam support. AnyGameStarter3 Version 2.4.zip | Description: Needs Generations or version 1.22, experimental Steam support. AnyGameStarter3 Version 2.5.zip | Description: Needs Generations or version 1.22, experimental Steam support. AnyGameStarter3 Version 2.6.zip | Description: Needs Generations or version 1.22, experimental Steam support. Question: Can I start the launcher to install mods etc.? Answer: Yes! Start the profile as usual and in the main menu select "Open Launcher". 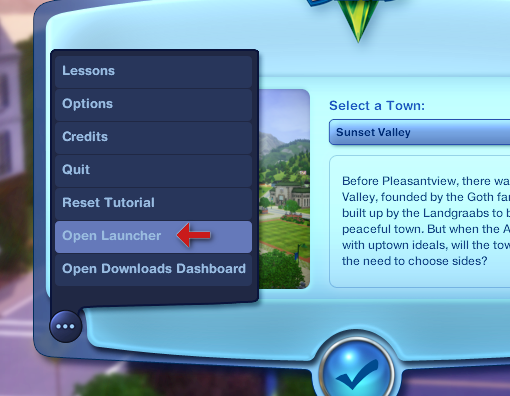 There is also an option to start the launcher in the context menu of each profile. Question: Can I manage different game versions? Answer: No. This tool can't start old game versions, as they aren't anymore on your hard drive. And managing multiple installations hasn't been considered, yet, and will be complicated. Question: Why does it always start with all expansions although I disabled some? Or why does it always load the default profile? Answer: Make sure you selected the right exe file. The right file, which should be selected by default, is the TS3W.exe in the base-game game/bin directory for games with at least the Generations patch. All other .exe files are only around 29kb small fake .exe files which do nothing else but launch the main TS3W.exe, but they launch them in a way that prevents AGS3 from adjusting the profiles as necessary. Answer: Adjusting the profile works by spawning the TS3W.exe in an environment which has the %userprofile% variable modified. As in general the Sims 3 profile is in the documents directory and the documents directory is in the userprofile, this way the location where Sims 3 reads and writes it's data can be adjusted. If the documents directory is not in the userprofile dir, it gets temporarily changed to %userprofile%/documents. Disabling EPs works by temporarily changing the permissions of the EP's registry keys, so the game doesn't find them while the profile is started. Starting the launcher in a profile may result in temporary files getting saved in the profile folder, resulting in problems when deleting the profile again as some files are considered as system files and can't be deleted automatically. When you have problems completely deleting a profile, manually delete the AnyGameStarter3\Games\<profile name> folder using Windows Explorer for example, which should work. Added version info to MainWindow. Editing the default profile has been disabled for safety reasons. If you still need to access it, press the ctrl-key while right clicking on the icon. Better localization. For example Swiss-German users will now get the Germany-German translation as automatic fallback. Tried to fix "folder not empty" message when deleting profile. Probably doesn't work 100% but at least you get a proper dialog window in case it fails. Opening the profile folder now raises a warning if it hasn't been created properly by first launching the profile one time. ZOMG! This! Is pure genius, I have been waiting for something like this ever since the first Sims 3 EP was released. You are brilliant! It's not working for me, when I try to open the AGS from the icon created on the desktop, it just says the program stopped working, and it shuts down every time. Maybe because some of my games were downloaded from EA store? #4 17th Jun 2010 at 6:03 PM Last edited by lewjen : 13th Aug 2010 at 2:23 PM. This is also useful for lot builders. Does it work now? If yes, does it say "version 1.1" in the bottom left corner of the application? Fantastic - but I broke it already. I have my My Docs on a secondary HD, F, so I created a new user account to test the AGS. I have both EPs, but I don't have HELS. Having created the account, I ran TS3 from the Ambitions exe to generate user files; then ran the AGS and tried to create a new profile. The new profile screen doesn't give me the option of selecting WA; and the default profile's properties don't show WA as available either. I believe this may be related to the game. After discovering that AGS wasn't detecting WA, I ran TS3 from the WA exe, and only then did I see the WA first startup tips (the "Your sim can go on adventures now!" popups in game); I didn't see them when I first started the game using the Ambitions exe. Unfortunately, this didn't fix the AGS, which still isn't detecting WA. Reinstalling AGS also has not fixed the issue, and nor has running FixRegistryRights. Is there a folder for World Adventures? Does it contain the correct path to the exe? Maybe you can export the "Sims" folder and Attach it here? Additionally, does it say "version 1.1" for you, too? I suppose there may be a cache issue where the site is publishing old files. Great! It's working just as it should now, thank you for the pointer Jonha. Well, it should have run this application automatically, if needed. Question again: Does it say "Version 1.1" at the bottom of the AGS window? #10 17th Jun 2010 at 6:28 PM Last edited by whiterider : 17th Jun 2010 at 6:41 PM. (Off-topic) The registry fixer did run automatically when I installed. The reg files are attached. It's a 64-bit system. Edit: Oops, attached the wrong file. Fixed. The reg files are attached. The reg file looks identical to mine (except the language) and should be OK. You don't have renamed your WA executable or something like that? Aha, I've fixed the issue - it was stupid user error. I'd used CFF Explorer to edit my game exes to allow >2GB memory (as well as various other things that looked interesting). Restoring the original exes fixed everything. Thankyou. Good to hear. Althoug I still don't understand how using CFF Explorer could cause something like this. AGS only checks if the TS3_EPxx.exe exists, not the file content. Oh yes, sorry it did say version 1.1 I got so excited it was working, I forgot to add that. Also the great thing about this AGS is you can use it on games purchased from the EA store, unlike The Sims 2 version by Numenor. Well, I just tested the game in Greek language. I was just thinking we needed something like this. Fantastic! Thank you! I've been wanting this for ages. Good to know that it works in my language.I should test it! #21 17th Jun 2010 at 8:13 PM Last edited by joninmobile : 17th Jun 2010 at 8:25 PM. I'm having problems getting custom content for the AGS to show up. I thought that I followed your instructions that you linked to perfectly, but maybe I missed something. I think I'm confused by the instructions, sorry. Your program files folder will not be duplicated, but it will of course create a separate user folder with save files etc. Depending on how much save files you create it can take around 200MB-2GB, but of course this would be the same if you would create additional saves in the main profile. Just installing AGS3 and creating a profile only consumes a few MB. Sorry for the not very detailed instructions. Do you have your mods in program files or in the documents folder? If they are in the program files, I first suggest moving them into the documents folder using my instructions. The game help on this site also covers moving the mods if you need help with that. If you moved your mods and they are (still) working with the normal game, you can just copy your Mods folder to the directory of the anygame and change the contents as necessary. Thank you so much! liek omg. Wow! This is ingenious. Another milestone has been set. Well done, jonha! #25 17th Jun 2010 at 9:51 PM Last edited by hazuitokage : 17th Jun 2010 at 10:11 PM. I also was waiting for something like that, but I'm curious about how this works with the patches ? With Ambitions and the latest patch needed for this to work, as you said, will the base anygame that I create be all patched too ? Edit : I'm asking relative to creation and uploading non-patched base-game compatible items etc, rather than a play point of view, in my case .